Hello Welcome to In the Moment with the Mermaid Pose! In the Moment with the Mermaid Pose! The Mermaid Pose is a delightfully sweet and easy pose. It requires almost no yoga know-how, except for a few pointers that I will give you and a cushion from your home. Don't be fooled, though, because the rewards of this pose are huge. The twists ring out your internal organs of their blood supply, then when released, replenish them with new blood and fresh oxygen. In Chinese medicine, the twists effect your liver and gallbladder meridians, restoring and balancing their chi. The energetic purpose of the liver and gallbladder are for coordinating the entire energy system of the body. Liver chi balances the emotions for a peaceful and calm internal environment. Gallbladder chi helps you stay on your personal path and maintain equilibrium in the process. 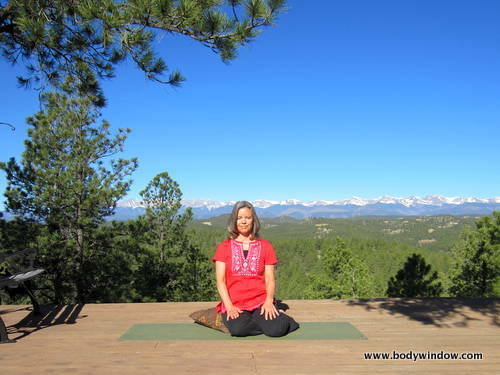 To begin finding your internal emotional balance, come to a sitting position on the ground. Bend your legs and roll them under and to the left of your hips. Place your left ankle in the instep of your right foot, so that your knees are parallel and point forward. Place a cushion under your right hip, at a diagonal, so that only the meaty part of the hip is on the pillow. The left hip stays down on the floor. You should feel this new position helping you align and lift your spine. Send your grounding energy downward through your right hip and the sides of your feet where they are touching the floor as you lift your spine at the same time. You are straightening and lengthening your spine in both directions; downward through the lower body, and upward through the heart and back of your neck. 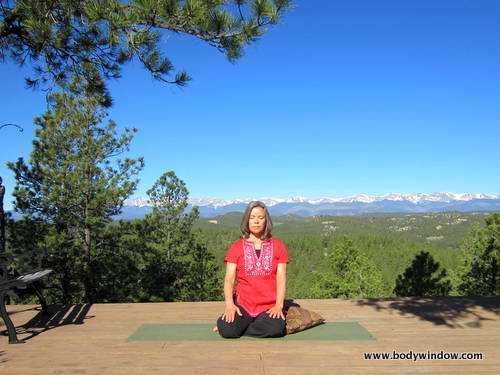 Breathe deeply and find a calm, centered place in your body. On your next inhale, lift your spine again and slowly twist toward the right as you exhale. Your left hand reaches for the outside of your right knee. Inhale and turn back to the center. This first movement was a test to see how your body responded. Now that you know, inhale again and elongate your spine. Exhale and twist again, this time holding the twist. Allow your right hand to find a comfortable spot to rest on the cushion in the back. Keep your shoulders relaxed and down. Do not pull with your left hand on your knee, except ever so slightly to guide your torso as it slowly opens to the twist. If you have more space, turn your head also to the right, to look over your right shoulder. Breathe deeply and hold this twist for at least 5 breaths, or up to 1-2 minutes as your body dictates. Return back to the starting position on a deep, sighing exhale. Inhale deeply to replenish your internal organs, and keep breathing deeply for another breath or two. Prepare to change sides, by straightening out your leg and removing the cushion. Roll your legs to the left, and place the cushion, like before, under your left hip. Perform the twist to the left, as with the right, testing it out the first time. On the second twist, hold it as with the right, for the same length of time you chose for the other side, for balance. You may be quite surprised that one side is much tighter than the other. This can even vary from day to day as your body changes and adapts to its environment. Breathe into your sides during your twists and send prana, or new energy and life into the area that is resisting the opening. 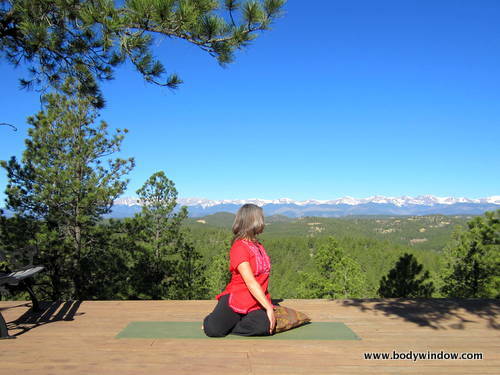 If you do this Mermaid Pose every day or so over the next month, I guarantee that you will notice a subtle change in your body and in your energy! Plus, the meditative approach to this pose will definitely calm you and help you find emotional release and more internal stability. This is the beauty of yoga. I release and wring out the old that no longer serves me! I invite in the fresh and new! I wring out all my attachments to people and/or things! I invite in Love and Compassion! I am balanced and stable in all things! I accept that what is, is as it is! I release control to God/the Universe! Or create your own personal affirmation(s), that your heart reveals to you during this introspective time! May you always release the old and invite in the new as you do your Mermaid Pose! May you feel the emotional release and the balance and stability provided through doing this Body Moment!